Add all ingredients to a mason jar, cover, and shake thoroughly. Vanilla Chia Pudding, add ½ tsp of vanilla in addition to ingredients above. Chocolate Chia Pudding, add 1 tbsp cacao powder in addition to ingredients above. Add with your favorite toppings. 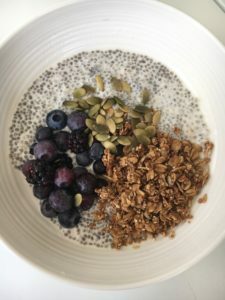 My favorites include frozen blueberries, banana slices, unsweetened coconut flakes, pumpkin seeds (pepitas), almond butter, flax seed, and/or hemp seeds. I prefer to use cashew milk because it’s thicker and seeds don’t clump at bottom as easily.